Set in a fictional city on the West Coast (i.e. California), with large cameos by Washington D.C. and the White House, “Heroman” is a show about, essentially, a very unlikely, introverted, 97-pound weakling type boy named Joey, and the trashed toy robot he repairs and calls Heroman, before an alien invasion centered on his hometown causes a freak bolt of lightning that allows Heroman to transform into a hulking, beefy All-American machine. Heroman himself is a mute hero, unable to express himself through words or facial expressions, though his eyes contain intelligence and thoughtfulness. His stoicism and loyalty to his owner, Joey, and the warmth and compassion Joey holds for Heroman and others, sets the tone for the rest of the series. In this sense, it begins with a “Boy Meets Robot” kind of beginning… but there is much more to tell. “Heroman” is currently 23 episodes into its run in Japan. As is typical of Studio Bones’ products, the animation quality is stupendous. For a “shonen” type series, it’s devoid of Dragonball Z-style martial arts or ki blasts and instead focuses on science – both human and alien – in a comic book, near future world. Themes such as friendship, loyalty, love, and certainly heroism, fill the show without the pretentiousness of other franchises. Joey isn’t a chest-thumper, but he does what is right, he displays great emotional and, yes, physical courage, and all this makes the show very entertaining indeed. 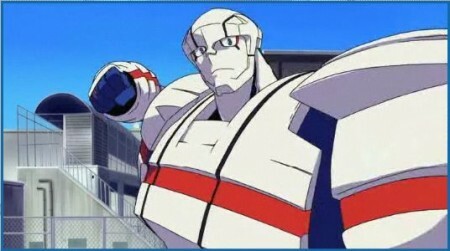 The show does not shy away from its American setting, with a fictional 3-letter agency investigating when the initial alien invasion is defeated (though of course it doesn’t really end there), air time for the fictional President (no, it’s not Obama, this isn’t Air Gear…) and features a pretty, though not classical, blonde cheerleader as Joey’s love interest, with her big brother football jock playing a “rival” role in the show. Well, that’s good enough for a general introduction. I plan to do blogging on things like actual episodes, as long as I have a helpful amount of spoiler tags and such. Thanks. This entry was posted in Anime, Culture, Japan and tagged anime, culture, entertainment, Japan. Bookmark the permalink. I’ve really been loving Heroman so far. Having grown up in So. Cal myself I can feel the effort they put into making it look fairly accurate. The story is fun and the animation is gorgeous. I’m so sad it might end soon though! I’m glad it wasn’t just my imagination. I’ve never lived in So. Cal, far from it, but it sure looked like they put in serious effort. The second ending theme, using cel characters against “real world” backgrounds, was very interesting because the backgrounds were vivid and from real life. This isn’t the only anime that’s pulled such a trick – Sekimatsu Occult Gakuen has a real-life girl laying in a field with a close-up on her face, no “animation” except some particle effects at the end – but Heroman’s ending just seemed to work better (for using such a trick). Also, I really dig the song they use.